DCplates.net is the result of my curiosity about how Web sites are created having arisen, coincidentally, shortly after I documented the history of Washington, D.C. license plates issued since 1966. This occurred in late 2003. My interest in collecting D.C. plates came about as a result of trying to acquire interesting plates to scan for inclusion on the site. I have participated in the hobby of license plate collecting since early 1972, I believe, and my interest in plates and their history increased upon joining the Auto License Plate Collectors Assn. in January 1978, when I was 14. I focused on plates of my home state of Massachusetts until I left for college in Kansas in the fall of 1981. I never returned to Mass. as a permanent resident, and shortly after leaving the state lost interest in seriously collecting plates from there, although I have continued to research and document their history. During my relatively brief stay in Kansas, and then Pennsylvania, I knew (at least subconsciously) that I was not long for those places, so although by the early 1980s I had realized that I enjoyed collecting and researching plates of particular jurisdictions, I didn't delve into their plates and registration history. 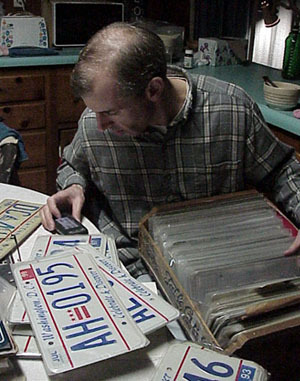 I didn't do much plate collecting during my two years in Kansas, but shortly after I moved to southern York County, Pa. in early 1984 I started to collect passenger car plates of the fifty states in detail, which is to say every year, every state, but not including Washington, D.C. I started this project because I needed an identifiable project on which to focus but I didn't want to concentrate on Pennsylvania plates, and it's difficult for a plate collector to specialize in a jurisdiction in which he or she does not reside. In the summer of 1986 I returned to New England, settling in Rhode Island. Now, for the first time I was in a state with what I thought was an interesting and almost completely undocumented registration history, and there was nobody here at the time specializing in plates of this state, nor did it appear that there had ever been. I had relatively few R.I. plates in my collection at the time, as I recall, and I immediately set about trying to find more. Within a few months, by the fall of 1986, I had adopted the goal of trying to acquire an example of every type and every year from Rhode Island, so I needed almost every R.I. plate that I encountered. My fledgling U.S. auto plate collection was put on the back burner. The other 49 states were a low priority, and D.C. simply didn't exist in my plate collecting universe. 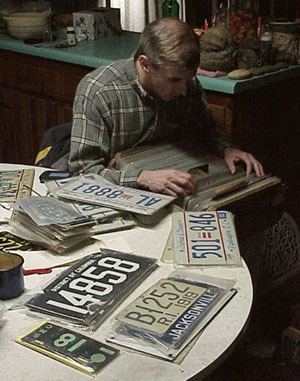 From a hobby perspective, the late 1980s and the entire 1990s were devoted almost entirely to Rhode Island plates and history. I kept my collections of the other 49 states up to date as best I could, and picked up older U.S. auto plates from time to time, but the focus was on my new home state, which is to say I wasn't investing resources in anyplace else, with a few exceptions such as a New Jersey research project and corresponding collection started in the mid-1990s. Because I've never had a place to display any of my collection, which is presently (in mid-Nov. 2011) comprised of about 15,000 plates, I've always relied on lists to keep track of what I have in its various sections. I spend a lot of my hobby time keeping the collection organized and documented. I don't recall exactly when I expanded the level of detail in my U.S. passenger plate collection list, but by February 2001, as my collecting of R.I. plates slowed (simply because during the previous 10-15 years I had assembled enough of a collection that there weren't so many new plates for me to seek and acquire), I had prepared and was using a detailed handwritten list of the composition of my year-by-year runs of each state. I prepared and maintained a master list showing the percentage completion of each state, based upon what I had compared to my definition of what constituted a complete set from each state. Washington, D.C. was not on this list because I had almost no plates from the Nation's Capital. I could justify omitting it from the list because it isn't a state, and to include it would have negatively affected my overall percentage of completion, so that's what I did. Aside from a few D.C. plates stashed in a box of miscellaneous collection items stored somewhere in my small house, D.C. still didn't exist. Things began to change, D.C. plate-wise, when in late 2000 or early 2001 I took the opportunity to buy a fairly complete run offered to me for a reasonable price. I don't recall the composition of this set, which is to say which years were present and which were absent, but I believe it was complete enough that I added D.C. to my master collection list. I do recall that the weakness of this set, like many D.C. collections, was the modern, multi-year plates. I have always collected natural plates for states and years in which multi-year plates were issued. I also stick to general-issue plates, avoiding plates with low numbers, personalized registrations ("vanity" plates), optional designs, and other characteristics that differ from the standard plate provided to the average motorist. Upon acquisition of my first D.C. set I determined that most of the 1974 and later plates did not fit in my collection because they had low numbers or were not naturals. (Fortunately, I have since expanded my D.C. collection to include low-number plates!) Therefore, although I now had at least a single example of a D.C. plate of each year from 1918 (I don't recall whether a porcelain plate was included with this set) through 1965, when annual plates ceased to be issued, my collection was still weak for years since then, when multi-year baseplates were issued. 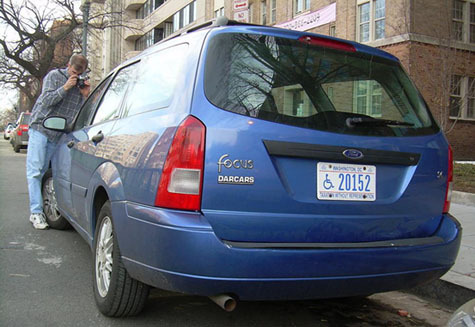 Photographing a vehicle parked near Scott Circle in early March 2007. I quickly determined that I couldn't begin searching for the natural, general-issue, multi-year baseplates that I needed to complete my D.C. run because I didn't know what they were. At the time, I didn't know when the 1974, 1978, 1984, 1991, and 2000 baseplates were introduced; I didn't know that the 1978 base was not part of a general reissuance and that the 1984 base was the last to be; I didn't know anything about the adoption of a staggered expiration system in 1983; and most importantly I didn't know which of the five multi-year baseplates were validated with natural stickers of various years. 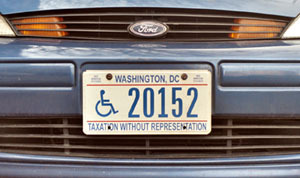 Without this basic information I couldn't identify which plate/sticker combinations were required for a complete, correct D.C. year-by-year set, so I had to learn about this interesting jurisdiction before I could effectively collect it. That was fine with me because uncovering and documenting this type of information is something that I enjoy. However, I was surprised at how little information was available, and therefore how much original research it would take to find the answers I was seeking. Although I don't remember details about how my work proceeded, I likely began by turning to back issues of the A.L.P.C.A. club publication to find what had been written on D.C. plates of the last 30 years. I do remember that I didn't find much information, and therefore set out to conduct original research. This undoubtedly began by studying the plates I had and documenting their characteristics in a paper that also included whatever I could find in A.L.P.C.A. and other publications. It probably didn't take long for me to identify the various baseplates simply by their appearance and slogans, at which time I would have begun to determine facts about their issuance based upon their registration numbers and year stickers on examples that I had and of which I had photos. As I learned, I wrote. The document in which I recorded D.C. multi-year baseplate information grew as I accumulated information, and in May 2003 it was complete enough to distribute to a small group of knowledgeable collectors for their review and contributions. Later in 2003, upon receipt of their feedback, the paper was completed and a corresponding checklist of base/sticker combinations that are required to constitute a complete set of D.C. auto plates since 1966 was prepared. As the paper evolved and facts became evident, I looked for the plates, and this effort continued for a few years, which is to say it took quite a while to locate examples of all the plates I had determined were needed. The title panel from the mock site created in a Web site design class in early 2004. I don't believe this was used on the live version of the site when it was launched in January 2006, but it may have indeed appeared briefly. By the end of 2003 I had a basic, respectable collection of D.C. passenger plates since 1918, and I had learned enough about baseplates issued since 1966 to have properly identified what I had and what I lacked. The paper prepared earlier in the year, and its accompanying base/sticker checklist, had evolved into a 20-page analysis of District of Columbia auto license plates issued from 1966 through 2003, and was set aside, having served its purpose. Completely separate from my license plate hobby, in late 2003 I became curious about how Web sites worked. I had first gone online in December 1999, in conjunction with my being appointed editor of the A.L.P.C.A. club publication effective Jan. 2000, so I had used the Internet and Web sites for a few years without much thought about how they appeared on my monitor. Towards the end of 2003, however, I was curious enough that I decided to take an introductory course at the local community college to learn about how to create a site using Dreamweaver software. (There were separate courses for Dreamweaver and Front Page; I chose the former based upon recommendations from friends with knowledge on the subject.) Towards the end of the course, around April 2004, each student had to create his or her own site, off-line on one of the computers in the classroom or on their own machine, that included text, photographs, and tables. Most of my classmates created sites comprised of one or two pages about their family or similar personal topics. It occurred to me, however, that the paper about D.C. plates that I had completed about six months earlier would be an ideal basis for my mock site because it included many tables and lots of text, and I had plenty of plates that I could scan and use on the various pages, so that's what I did, and that was the beginning of the site. After the course ended I don't recall doing much more work on the mock D.C. license plate site I had created. I was busy helping to plan the 2004 A.L.P.C.A. convention, and other hobby- and non-hobby-related tasks occupied my spare time. I didn't think much more about it, in fact, until late December 2005, when for a reason I can't recall it piqued my interest and I returned to working on it with the intention of publishing it on the Web, which occurred on Jan. 16, 2006. 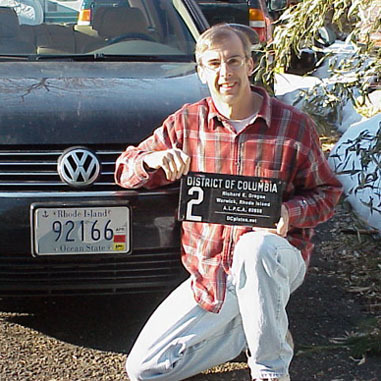 Since then, I have continued to work on it and to collect plates from the District of Columbia. Studying potential acquisitions at the home of a well-established plate collector in Pennsylvania. Unfortunately the porcelain plate (no. 14858) was not for trade or sale, but during this March 2010 visit I did obtain a number of recent plates, some of which are now in my collection and on the Web site. In the photo on the right I'm comparing plates in the box to what I already have by using my phone to view a page (this one) on the Web site.